Today is April 10th. A date that is etched into my brain for one annoying reason. Today is my childhood bully’s birthday, and for some reason, I can never forget it. A girl who made my life miserable from about grade 5 until freshman year of high school. I don’t think of this girl often, as it’s been 20 years since I last saw her, but every April 10th I remember it’s her birthday. I hope wherever she is, she’s happy, as I can assure you she was not as a kid. I met D’Vile (Ha! Get my play on words?!) when I picked her mom to babysit my sister and me. It was between a lady who had a nice boring house that abutted my school or her mom, who had a super fantastic playground and a POOL in the backyard. Pretty easy decision when you’re 9. It started out fun enough. Her mom was nice. A little possessive of food (meaning I couldn’t grab Little Debbie’s whenever I wanted, which to me, was the End. Of. The. World. ), but otherwise a good babysitter. Her dad worked 3rd shift at the Jeep Plant and was chronically laid off. (Sidenote: This was my first real experience with a loser. He basically scared the crap out of me. Lord help his kids (never us thank God) if he had to get his paddle, which was hung on the wall as decoration, for punishment. It was sadistic. Not because of the paddling, but because of the psychological torture leading up to said paddling. Crazy. No wonder this girl was messed up. He was often laid off and was always smoking and drinking beer even before we left for school. His favorite pastime was recording on VHS Looney Toon cartoons on the TV in some sad desperate attempt to “get them all.” (Poor dude, all that time wasted, I can buy him a complete DVD set now for $50). And another fun fact, he had a “secret” room. One with a padlock on it in the basement. As kids, we never thought anything of it, except it had plants and a lot of neon lights in there when we did see the door open. In grownup hindsight, dude was growing his own medicinals if you know what I’m sayin. Anyways, I’m just providing some background. Here’s the thing that freaks me out and makes me kind of a crazy parent – my parents never knew any of this. Why? Because I didn’t think they needed to know. First, I had no idea about the pot. Second, they never hit or yelled at me or my sister, so I thought this was just the way it was in their house. They basically were good to us; it was their own kids they fucked with. Anyways, back to D’Vile. It started kind of slow and as a kid, I didn’t recognize it. First, there was another girl her mom watched that she was just plain ol’ mean to. They blamed her for everything that went wrong, made her feel crazy, fat and ugly, all for no apparent reason, except maybe D’Vile’s mom didn’t like her mom. She eventually left. I met this girl again in my 20s. We ended up working in adjoining cubicles at my 8 months of torture call center job, when I recognized her name. She survived and turned into a nice normal adult, but has very different memories of her time there, but it still has the same crazy undertones I remember. After she left, they turned on my sister. I don’t know why they never picked on me, I think it’s because of my wallflower tendencies. I remember one day they pulled her chair out from under her as she was sitting down just to be mean. As her older sister, I started to cry. Cry because no one had ever been mean like that to my sister (besides me) and I didn’t know how to stop it. This girl and her little brother terrified me. Never once did I think to tell my parents. So, this girl and I were friends. Friends in that I was terrified to not be her friend. We were in the same class that year, and I noticed she was mean to others around me and I didn’t like it. I never had the balls to stand up to her and defend any of my classmates, I just stood by hoping she wouldn’t turn on me. As time went on, we got older and eventually stopped being watched by her mom, and after a few years of this “friendship,” it got too much for me. Some straw broke the camel’s back. I can’t remember what now, but I remember my real best friend and I decided to take a stand. We completely stopped talking to her, which at 10 was totally the right way to go about ending a friendship with an unstable crazy bully. Let’s just say that didn’t go over well. Over the course of the next few years, all culminating at a rough inner city middle school, she made me and mostly, my best friend’s, life a living hell. She called my friend butterball and other fat names when we got off the bus each day. She’d follow us home. Things never got physical thank God, but then, girls are much more sadistic about bullying. They go for the jugular, and by jugular I mean tear into an 11 and 12 year old girl’s physical appearance. It was pretty brutal. Things got better when my best friend and I went to the private high school and she continued onto the public high school. We no longer saw her and thought it was over. Then, one summer we started getting prank calls. This was pre-technology anything. Heck, we still had rotary phones in our house and caller ID hadn’t yet been invented. Now, as the babysitter of my younger sister, initially these calls were terrifying. I was alone in a house all day long with my sister and some weirdo kept calling, breathing into the phone and then hanging up. We called the police and they put a tap on our line (or the phone company did, I can’t remember.) All we had to do was pick up the phone each time for it to record. I don’t know how we figured out it was her, but we did. One day she called and hung up over 200 times, which I knew because I had to keep track of and pick up the phone each time. Nothing really happened when they tracked it back to her. I think we pressed charges, but not much was done. I think they found out she was stealing from someone else and got in trouble. Her parents divorced. I went to high school, tried to fade into the background and not draw any attention to myself in true introvert fashion, pretty much hated it, and survived. Life got dramatically better in college and I grew up to what I am now – a fairly confident 30-something. I wish I could take my 33 year old brain back to that 8 year old girl I once was. I would tell her what I was confirming in my young brain – that this girl is batshit crazy, you should tell your parents, and get away from her and her family at all costs. That you and your best friend were beautiful, funny and smart and to never let some scrawny insecure little girl make you doubt that. Funny thing is, this girl still has a bit of power over me. Right now, I am a wee bit afraid of putting this on the interweb for fear she will find me again and start all over again. But, with some preliminary research, I am pretty sure this girl is mostly off the internet grid. So maybe, if we’re real quiet, it won’t get back to her. 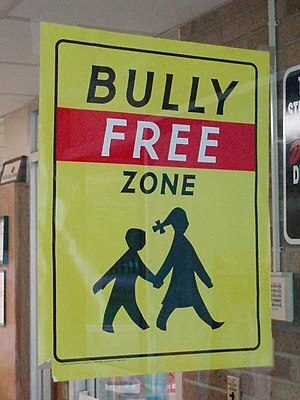 I guess to wrap up, bullies still scare the crap out of me. My son is just starting to experience mild forms of it, but so far, we have escaped mostly unscathed. I am sure this is temporary as my kid is quirky, intelligent and funny in a weird way, which will eventually make him a target. And my daughter is fairly timid in her interactions with kids her age and basically lets her friends run all over her. I am absolutely clueless on how to handle this. Do I helicopter over them, so I am not largely unaware as my parents were? Do I teach them when, where and how to defend themselves? How do I teach them biting sarcasm and dry humor that has become my defense as an adult against big meanies? I have no idea. Guess I’ll Google it or ask around if and when the time arises that I have to deal with it. I am just terrified some punk is going to stub out the quirky, unique, adorable strengths of my children way before they realize it’s those traits that make them awesome. I never want my kids to feel they have to fit into some box of preconceived normal. I want them to think for themselves and be leaders. I want them to have best friends who look out for them and love them for who they are, not because they are good at a sport or drive a fancy car (not likely on both accounts – they do have us as parents.). I just hope I’m doing something right and can guide them through as best I can. What are your thoughts? What are you doing for your kids? I’m all ears. This entry was posted in Memories, Parenting and tagged bully, family, High school, Student, Violence and Abuse, Youth. Bookmark the permalink.